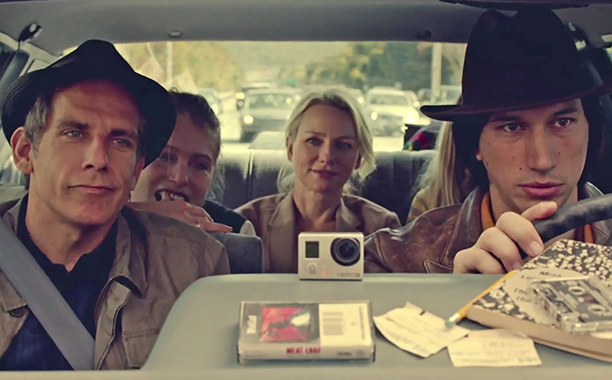 Things begin on an entirely Woody Allenesque note, with fortysomethings Josh (Ben Stiller) and Cornelia (Naomi Watts) struggling with the idea of impulsiveness. We’re still young, Cornelia insists, proclaiming that if they were to drop everything and going off to Paris or Rome tomorrow, they could. This “tomorrow” pricks at Josh, who wonders about last-minute flight prices and thinks they’d need at least a month in advance. A month still counts as impulsive, she says undeterred, mostly talking to herself. It is, as you can see, boilerplate Allen with a very Alexander Desplat-y score thrown in, but this may be to soothe us in before pulling the rug out from beneath our ol’ feet. Josh is a documentary filmmaker, a fiercely committed artiste who has spent the decade milking a grant to create a film he believes in, a film which is, essentially, “about America.” One day, he bumps into a cool young fan. Jamie (Adam Driver) is an effortlessly stylish youngster with gimmicky ideas and that hipster-y fondness that often mistakes what is old for what is good, and Baumbach makes us wonder if his affection for Josh’s work is genuine, or the same as his love for Rocky III. Jamie and his artisanal ice-cream making wife Darby (Amanda Seyfried) start hanging out with Josh and Cornelia and invite them to radically bohemian ceremonies — where people wear white, drink sludgy psychotropic drinks, and vomit to Vangelis — but no matter how much fun they’re having, Jamie and Darby never, ever reach for the check. Watts, coming off a marvellous performance in Birdman, is one of those actresses who wears the suit of age with such weary believability that it almost masks her beauty — like Claire in Modern Family. And again, because of the cinematic baggage she carries, we begin to buy into Baumbach’s concept of aging: that after more than a dozen years, even one who so gloriously pleasured herself in Mulholland Drive is now relieved to be asked to the party. Driver is a compelling actor, a distinctively quirky looking chameleon who plays his part in a defiantly unreal way, which makes him great casting for this role where his young auteur doesn’t mind not really being an auteur at all. And Charles Grodin, as mentioned at the head of this review, wears omniscience so, so delightfully, just like he does in TV’s Louie. This is the first truly great film of 2015. It is a film worth watching and recommending and loving, like a novel you can’t wait to lend to friends you care about. And as the end-credits rolled with Golden Years playing, I realised even David Bowie’s older now. And that doesn’t seem so bad. Just look at Woody Allen.